Find your School's supply lists and WishLists. 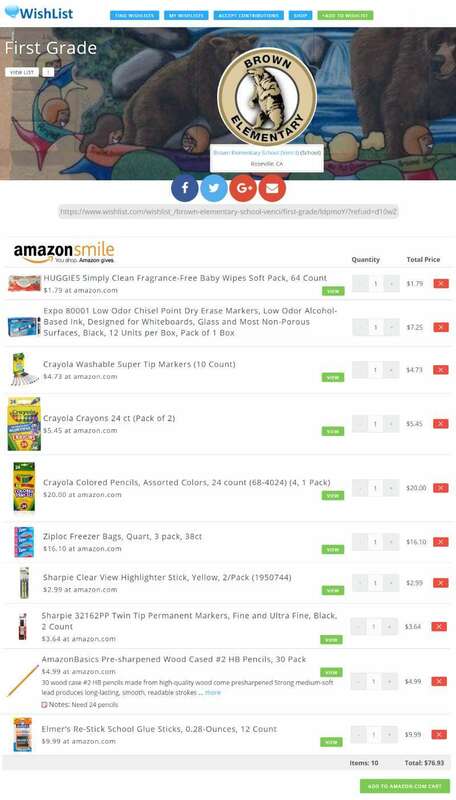 WishList.com takes the hassle and the guesswork out of shopping for school supplies by making them purchasable online. Save time and gas by shopping online. Get the exact items that the teacher wants. All of the items are already in one list that you can just add to your cart and have shipped directly to your home. Get the exact supplies that each teacher requests. WishList.com provides the supply lists in an easy to use format where all items are put into your cart with the click of a button. There is no cost to the school for this program. It's a turn-key program. All you have to do is put the link on your school's supply list page and send the link out to parents in an email explaining the program. We can provide you with the email and link. Use WishList.com to achieve your fundraising goals. You can accept contributions toward high ticket items like computers or smartboards. Or, just set a general fundraising goal and allow people to contribute any amount they are comfortable with. WishList.com is a participant in the Amazon Services LLC Associates Program, an affiliate advertising program designed to provide a means for us to earn fees by linking to Amazon.com and affiliated sites.